Back when we asked begged Anna to join us at Any Other Wedding, we knew that if she was bonkers enough to say yes, she would be AMAZING. No doubt about it. What we didn’t know, was just how amazing. I don’t know that I can tell you how awesome she’s been, without making Clare and I sound awfully lazy (which we’re not!) and Anna sound ever so bossy (which she very definitely isn’t!) but suffice to say-there’s some good stuff coming! I have proof. I met Anna after work on Monday for cocktails and Work. There were definitely cocktails and oddly, definitely Work! 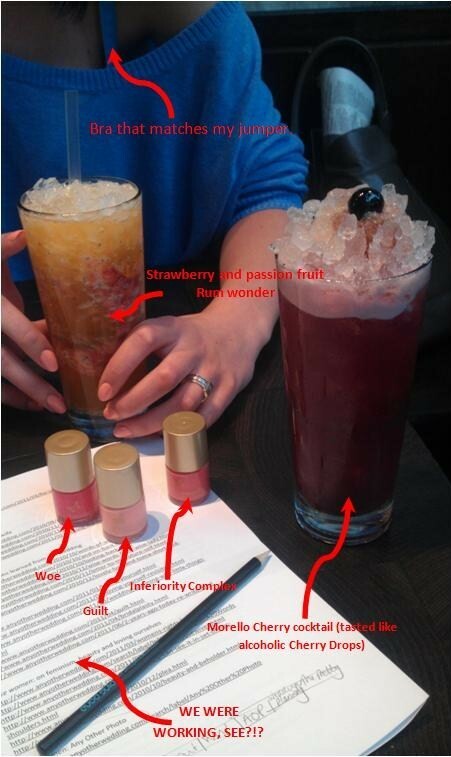 As well as a little bit of blog design, post-categorising, Clare-skyping and cocktail drinking, there was also the development of the AOW Nail Polish line. Sort of. I bought Anna a selection of coral polishes as a Thank-You for kicking my arse recently in a non-blog related matter…I modelled the palest colour and called it ‘Guilt’ in honour of my overriding complex at her having to kick my bum into gear. Then there was ‘Woe’ (as in ‘I am woeful I was such a drippy moo’) and ‘Inferiority Complex’ (how I feel around Anna and Clare all.the.time.) Full catalogue of colours to follow. The point to this post? Mostly to reassure you that we have got this. Any Other Wedding would not have made it this far without you-and we won’t make it any further without you. And as a thank you, we’re working our socks off to make AOW the best possible place for you. I still can't believe that you managed to find three beautiful coral coloured nail varnishes. As previously discussed, the only coral I've ever found seems to match the colour of a bin-man's trousers. Not such a good look. Oh, and Anna – you rock. That is all. We're rebranding these nail varnishes into Awesome, Blooming and Ladies. Didn't you hear this is No Negativity Thursday? Get on with your bad selves! Thanks for being my favourite daily blog fix. Bra that colour matches the jumber – Aisling, I am in awe of you. I like Penny's rebranding suggestion. Katie-I know! The jumper is a v fine linen/wool knot and so it's slightly see-through, cue much concern about what to wear underneath it! (not enough concern to not buy it, admittedly!) I got home, lo and behold, a trusty M&S; bra was exactly the same shade! Awesome. Penny-consider the nail varnishes rebranded! You can join our marketing team! Glad you've all enjoyed this week-thank you kittiwakes for your loveliness! To clarify, I meant 'littlewife'. I have NO idea what word my iPhone just made up.